We are asking the hospital to instruct USDA to postpone any planned turkey killing, implement a no feeding policy, allow more time for methods to curb the growth of the turkey population, and other alternatives. The turkeys have been on Staten Island for over 10 years, and it can't be expected that the coexistence issues can be solved in 10 minutes. Please call and then email South Beach Psychiatric Center and local elected officials listed below. The turkeys are not posing any imminent threat whatsoever. The community was outraged when approximately 90 turkeys were killed in August, and since that time 28 of the turkeys were relocated to Catskill Animal Sanctuary (photo above), where they will live out their lives, unlike those that were killed in August, and any killed this weekend. 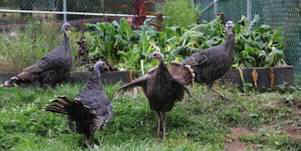 The killing of these turkeys is wrong, and a solution can be found. Please take a few minutes to make these important calls. The USDA has not rounded up the turkeys as of yet, but inside information has shown imminent plans to kill more of the turkeys this weekend. The hospital is located at 777 Seaview Ave, Staten Island, NY, please go there tomorrow morning [October 26] if you can.